HermanMelville is a Legacy Library. Legacy libraries are the personal libraries of famous readers, entered by LibraryThing members from the Legacy Libraries group. » Herman Melville's legacy profile. HermanMelville is also an author. 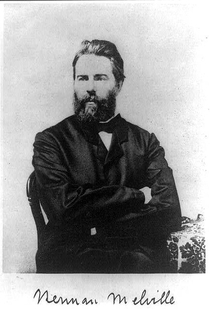 » See Herman Melville's author page. About meLike his creation Bartleby, Herman Melville's biography is spotty at best to assemble. He took to the seas as a young man (the experiences of which informed his writing, in particular the early novels). A "whale-ship was [his] Yale College and [his] Harvard." As he grew older, perhaps not in small part because of economic hardship and the loss of both of his sons, Melville became increasingly recluse and brooding. BeA = Berkshire Athenaeum, Pittsfield, Mass. BoA = Library of the Boston Athenaeum. Herman Melville's library has been graciously catalogued by Merton M. Sealts, Jr. in his work Melville's Reading. In addition to the Revised and Enlarged edition published in 1988, a cumulative supplement was published in Leviathan in March of 2004. Only 285 books have survived from Melville's library, although it has been argued that his collection included around 1,000 books. Voyage descriptif et philosophique de l'ancien et du nouveau Paris, ... orné du plan de Paris et de 50 gravures. Nouvelle édition ... augmentée. Par L[ouis] P[rudhomme] by L. P.